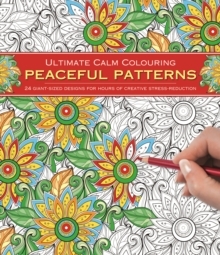 Relax and unwind with this stress-relieving colouring book of intricate patterns. The art of colouring can help to focus the mind and still the mental chatter that saps our energy and causes stress and negative feelings. As you start to colour in these designs you will unleash your inner creativity and find yourself gradually moving to a more peaceful and calming state of mind. You can colour in as little or as much as you like, taking your time to develop your picture the way you want it. There are no hard or fast rules, you are truly free to create your own unique designs using pencils, pens or paints. Start colouring today and enjoy the still, quiet voice of calm this simple meditative practice will bring.